Forward-looking: There are a lot of things that can make air travel miserable: delays, transfers, food, overzealous TSA staff, other passengers. But one element that most people hate is being allocated a plane's middle seat. With Embraer's new E190-E2, however, that’s not an issue—it doesn’t have any. 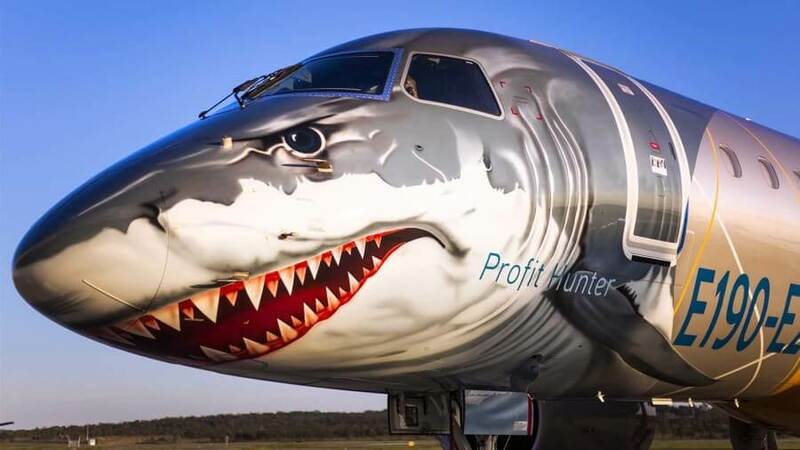 The Brazilian aircraft manufacturer has been taking one of the new jets from its E2 family, which has been nicknamed ‘Profit Hunter,’ on a tour of the world. It's on show in Dublin today, having already made appearances at events in the US, China, and Africa. In addition to coming with a 2-2 seating formation and some snazzy livery—tiger, eagle or shark designs are available—the E190-E2 boasts larger windows, allowing passengers a better view while filling the cabin with more natural light. Overhead bins are also improved, now 40 percent bigger to accommodate large carry-on luggage. Additionally, Embraer says it’s the most fuel-efficient single-aisle aircraft on the market, burning 17 percent less fuel than its E190 predecessor. “Preserving passenger personal space is the goal,” Rodrigo Silva e Souza, vice-president of marketing for Embraer Commercial Aviation, told CNN Travel. The aircraft, which can carry 150 passengers, is currently being used by Scandinavian Airlines' regional subsidiary, Widerøe. Embraer says 2,820 commercial aircraft up to 150 seats will be delivered to European operators over the next 20 years. As noted by CNN, the largest E2 customer is SkyWest, a regional airline affiliate flying for the likes of American Airlines, Delta, United and Alaska Airlines, meaning US travelers will eventually be able to enjoy all the jet's benefits, though not until the first of the smaller E175-E2 orders are delivered in 2021.